Like many people, you might be caring for an elderly parent or family member. That care should include a focus on their teeth and gums — a healthy mouth is vitally important to their overall health, nutrition and well-being. Because of the aging process, this can be challenging. Here are 4 areas where you should focus your attention to assure the senior adult in your life has the healthiest mouth possible. Make adjustments for hygiene. As we grow older, arthritis and similar conditions make brushing and flossing difficult to perform. You can help your senior adult keep up these vital tasks by switching to a powered toothbrush or refitting their brush with a bike handle or tennis ball to make gripping easier. Pre-loaded floss holders or water irrigators are effective alternatives to manual flossing if it becomes too difficult. Have dentures or other appliances checked regularly. Many older people wear full or partial dentures. Due to the nature of these appliances, the risk of bone loss over time is greater, which can eventually affect their fit. Their dentist should check them regularly and reline or repair them if possible. Eventually, they may need a new appliance to match any changing contours in the mouth. 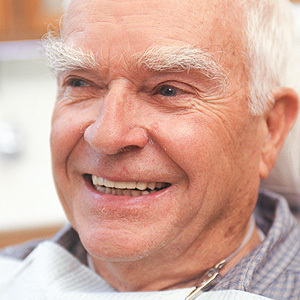 Be aware of age-related dental issues. Age-related conditions of both the mouth and the body (like osteoporosis, which can affect bone density) can impact dental health. For example, an older person can develop lower saliva flow, often due to medications they’re taking. This, as well as gastric reflux common in older people, increases acidity and a higher risk of tooth decay. Past dental work like fillings, crowns or bridges may also make hygiene and additional treatment more difficult. Keep up regular dental visits. In light of all this, it’s crucial to keep up with regular dental visits for continuing teeth and gum health. Besides cleanings, these visits are also important for monitoring signs of tooth decay, periodontal (gum) disease and oral cancer. It’s also a good opportunity to gauge the effectiveness of their hygiene efforts and suggest adjustments.